In spite of the warm weather of yesterday afternoon, a goodly number of members of the Thought and Work club, with guests, gathered in Wesley chapel to meet Swami Vive Kanonda,* a Hindoo monk, now travelling in this country, and to listen to an informal address from that gentleman, principally upon the religion of the Hindoos as taught by their Vedar (Vedas.) or sacred books. He also spoke of caste, as simply a social division and in no way dependent upon their religion. The poverty of the majority of the masses was strongly dwelt upon. India with an area much smaller than the United States, contains twenty three hundred millions [sic] of people, and of these, three hundred millions [sic] earn wages, averaging less than fifty cents per month. In some instances the people in whole districts of the country subsist for months and even years, wholly upon flowers (Mohua. ), produced by a certain tree which when boiled are edible. In other districts the men eat rice only, the women and children must satisfy their hunger with the water in which the rice is cooked. A failure of the rice crop means famine. Half the people live upon one meal a day, the other half know not whence the next meal will come. 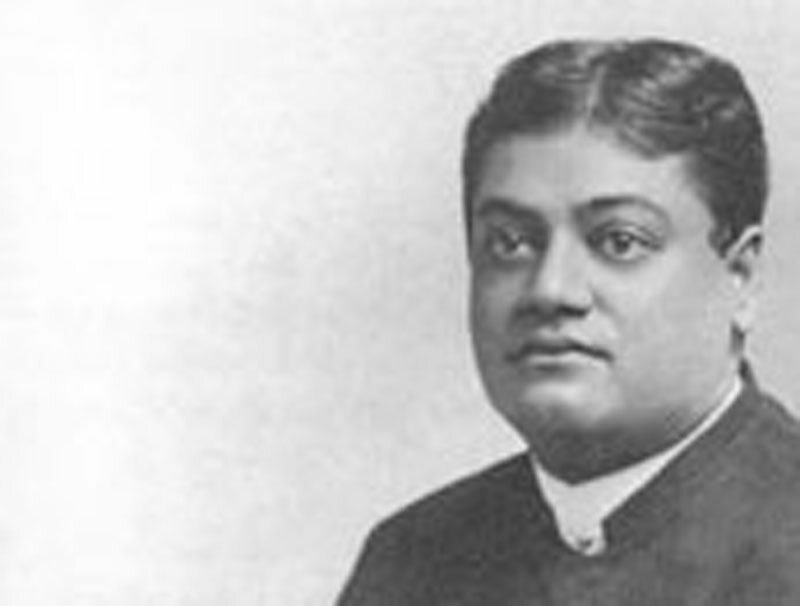 According to Swami Vive Kyonda, the need of the people of India is not more religion, or a better one, but as he expresses it, "practicality", and it is with the hope of interesting the American people in this great need of the suffering, starving millions that he has come to this country. He spoke at some length of the condition of his people and their religion. In course of his speech he was frequently and closely questioned by Dr. F. A. Gardner and Rev. S. F. Nobbs of the Central Baptist Church. He said the missionaries had fine theories there and started in with good ideas, but had done nothing for the industrial condition of the people. He said Americans, instead of sending out missionaries to train them in religion, would better send some one out to give them industrial education. Asked whether it was not a fact that Christians assisted the people of India in times of distress, and whether they did not assist in a practical way by training schools, the speaker replied that they did it sometimes, but really it was not to their credit for the law did not allow them to attempt to influence people at such times. He explained the bad condition of woman in India on the ground that Hindoo men had such respect for woman that it was thought best not to allow her out. The Hindoo women were held in such high esteem that they were kept in seclusion. He explained the old custom of women being burned on the death of their husbands, on the ground that they loved them so that they could not live without the husband. They were one in marriage and must be one in death. He was asked about the worship of idols and the throwing themselves in front of the juggernaut car, and said one must not blame the Hindoo people for the car business, for it was the act of fanatics and mostly of lepers. The speaker explained his mission in his country to be to organize monks for industrial purposes, that they might give the people the benefit of this industrial education and thus elevate them and improve their condition. This afternoon Vive Kanonda will speak on the children of India to any children or young people who may be pleased to listen to him at 166 North street, Mrs. Woods kindly offering her garden for that purpose. In person he is a fine looking man, dark but comely, dressed in a long robe of a yellowish red colour confined at the waist with a cord, and wearing on his head a yellow turban. Being a monk he has no caste, and may eat and drink with anyone. Rajah* Swami Vivi Rananda of India was the guest of the Thought and Work Club of Salem yesterday afternoon in the Wesley church. A large number of ladies and gentlemen were present and shook hands, American fashion, with the distinguished monk. He wore an orange colored gown, with red sash, yellow turban, with the end hanging down on one side, which he used for a handkerchief, and congress shoes. He spoke at some length of the condition of his people and their religion. In course of his speech he was frequently and closely questioned by Dr. F. A. Gardner and Rev. S. F. Nobbs of the Central Baptist church. He said the missionaries had fine theories there and started in with good ideas, but had done nothing for the industrial condition of the people. He said Americans, instead of sending out missionaries to train them in religion, would better send someone out to give them industrial education. Speaking at some length of the relations of men and women, he said the husbands of India never lied and never persecuted, and named several other sins they never committed. Asked whether it was not a fact that Christians assisted the people of India in times of distress, and whether they did not assist in a practical way by training schools, the speaker replied that they did it sometimes, but really it was not to their credit, for the law did not allow them to attempt to influence people at such times. He explained the bad condition of women in India on the ground that Hindoo men had such respect for woman that it was thought best not to allow her out. The Hindoo women were held in such high esteem that they were kept in seclusion. He explained the old custom of women being burned on the death of their husbands, on the ground that they loved them so that they could not live without the husband. They were one in marriage and must be one in death. As for the worship of idols he said he had asked Christians what they thought of when they prayed, and some said they thought of the church, others of G-O-D. Now his people thought of the images. For the poor people idols were necessary. He said that in ancient times, when their religion first began, women were distinguished for spiritual genius and great strength of mind. In spite of this, as he seemed to acknowledge, the women of the present day had degenerated. They thought of nothing but eating and drinking, gossip and scandal. The speaker explained his mission in his country to be to organize monks for industrial purposes, that they might give the people the benefit of this industrial education and thus to elevate them and improve their condition. The learned Monk from India who is spending a few days in this city, will speak in the East Church Sunday evening at 7-30. Swami (Rev.) Viva Kananda preached in the Episcopal church at Annisquam last Sunday evening, by invitation of the pastor and Professor Wright of Harvard, who has shown him great kindness. On Monday night he leaves for Saratoga, where he will address the Social Science association. Later on he will speak before the Congress in Chicago. Like all men who are educated in the higher Universities of India, Viva Kananda speaks English easily and correctly. His simple talk to the children on Tuesday last concerning the games, schools, customs and manners of children in India was valuable and most interesting. His kind heart was touched by the statement of a little miss that her teacher had "licked her so hard that she almost broke her finger". . . . As Viva Kananda, like all monks, must travel over his land preaching the religion of truth, chastity and the brother­hood of man, no great good could pass unnoticed, or terrible wrong escape his eyes. He is extremely generous to all persons of other faiths, and has only kind words for those who differ from him. Rajah Swami Vivi Rananda of India spoke at the East church Sunday evening, on the religion of India and the poor of his native land. A good audience assembled but it was not so large as the importance of the subject or the interesting speaker deserved. The monk was dressed in his native costume and spoke about forty minutes The great need of India today, which is not the India of fifty years ago, is, he said, missionaries to educate the people industrially and socially and not religiously. The Hindoos have all the religion they want, and the Hindoo religion is the most ancient in the world. The monk is a very pleasant speaker and held the close attention of his audience.
. . . The platform was next occupied by Vive Kananda, a Monk of Madras, Hindoostan, who preached throughout India. He is interested in social science and is an intelligent and interesting speaker. He spoke on Mohammedan rule in India. The program for today embraces some very interesting topics, especially the paper on "Bimetallism", by Col. Jacob Greene of Hartford. Vive Kananda will again speak, this time on the Use of Silver in India.